Well, I intended to get back to blogging last week, but then the election results hit me like a fist to the belly and it took me several days of after-work alcohol and television binging to begin picking myself up. In totally not comparable but also sad-to-me news, I got rid of my Adobe InDesign subscription to save money and now am making my lead images on school computers, so I have to use system fonts. Waaaahhhh! But okay, perspective, perspective. So here’s this week’s post! Back to the weekly Wednesday posts from next week. Some things are universally human, and dad jokes seem to be one of them. The Korean term for dad joke is ajae gaegŭ (아재개그), and Korean dad jokes are just as…funny…as the ones English-speaking dads make. 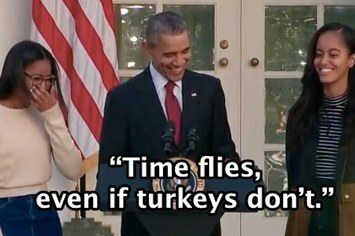 Even Obama can’t help making dad jokes. Source. The term itself is a combination of a Korean dialect word, ajae, and an English-derived word, gagŭ. Ajae is a dialect word found throughout North and South Korea, and even among the large ethnic Korean population in China, but the meaning varies from “uncle” in the Kyŭngsang region in Korea’s southeast to “aunt” in the Hamhŭng district near North Korea’s Russian border. Indeed, ajae can be used for most male relatives in one dialect or another, and apparently for almost all of them in Kyŭngsang (김소영 2007). In many of those places, it’s also used for Standard Korean’s ajossi (아저씨), a generally respectful but not always complimentary word for a middle-aged to old-ish man. The first image says “Santa,” and the second image, which has two Santas crossed, says “Santa k’rosŭ.” Both “cross” and “Claus” could be written k’rosŭ (크로스) in han’gul, the Korean alphabet. I got this one from this ajae gaegŭ Facebook group. Halmŏni is the Korean word for grandmother, but it sounds like a Koreanized pronunciation of harmony—thus, it’s eHarmony (pronounced something like “ee-hal-muh-nee”), the famous online dating site. 4. Q: A building made of phones? The otherwise nonsensical Korean phrase “콜(call)로 세움,” or k’ol ro seum, translates to “built of calls.” I also got this one from the ajae gaegŭ Facebook group. “Gag.” Dictionary.com. n.d. Internet. November 4, 2016. 김소영 2007. “아재”의 의미 특성 및 관련된 몇 문제들. 관악어문연구. 32권0호, pp. 121-140. “아재.” 다음 한국어 사전. n.d. 인터넷. 2016년11월04일. 아재개그. 페이스북 그룹. Accessed 2016년11월17일. “映畵寸評.” 매일신문. 1961년07월01일. KINDS. 2016년11월04일.